Many people think of tea lattes as hot drinks that should be enjoyed in cold weather or on cool mornings. Just as many coffee drinks are good over ice, so are tea lattes and they’re a great alternative to a regular pitcher of iced tea when you want a drink to cool down with on a summer afternoon. 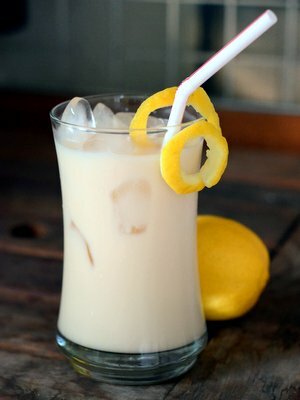 This Iced Lemon Tea Latte is one of my current favorites and was inspired by another summer classic: lemonade. The lemon tea latte starts with a lemon-flavored tea. I used Cuppa Cakes Lemon Chiffon, which has a very clear lemon flavor in a mild herbal green tea base. I brew tea at double or triple strength for iced tea lattes, since you’re going to be diluting the tea quite a bit with both ice and milk. I brew the tea hot, add sugar and a touch of vanilla extract (a few drops of lemon extract can be added to boost the lemon flavor on a tea where it is not present or not prounounced), then pour it over ice and finish it with cold milk. It’s creamy, lemony and it has just the right amount of sweetness. I like to think of it as somewhere between lemonade and a milkshake – and for a lemon lover, it will be a instant hit. Do not be tempted to use regular lemon juice in place of the lemon tea or lemon extract, as it can curdle the milk (and you’ll need to add more than a few drops for a good lemon flavor). Fortunately, there are lots of lemon-flavored teas – black, green, white and herbal – available, and this recipe can be adapted to any one of them by adjusting the sugar level slightly. In a small saucepan or microwave-safe container, bring water to a boil. Remove from heat and add in tea bags. Allow to steep for 3-4 minutes (depending on the tea). Remove tea bags and stir in sugar, vanilla extract and lemon extract. Pour hot tea over the glass of ice. Top with milk, then garnish with a lemon twist and enjoy!